Everybody knows what pixie dust is. But have you ever heard of a glitter witch? Neither had we, but as soon as we saw this sparkly Girls Glitter Witch Costume we had a pretty good idea of where they'd fit according to the Grand Unified Theory of Magical Beings. At a glance, you can probably tell that they've got the spritely charm of pixies, mixed with the talent for potionmaking and elixirs that you find in most 'ordinary' witches. Those fingerless gloves? Very helpful for getting a grip on a squirming toad or a slippery newt. But there's more to their outfit than that! The black robes might make them appear similar to dark sorceresses, yet glitter witches are much less fond of necromancy than their evil cousins (thank goodness). They're just known to do a lot of stargazing, so they wear clothes that remind everyone of their love for the night sky! 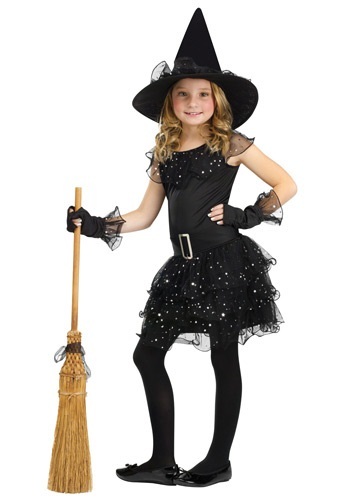 This cheery outfit provides a complete witch look, unless you plan on flying by broomstick. And if you're traveling on foot, you'll probably want to bring along some dressy shoes to match all of that shiny glitter! But this is a great option for anyone who would rather spend more of their time honing their spellcraft, and less time applying green makeup and fake warts. It's right here in the Beginner's Guide to the Grand Unified Theory of Magical Beings, First Edition: to make a glitter witch, the most important ingredient is you!